Kimbo Slice, is a Bahamian born American boxer, mixed martial artist and occasional actor. He became famous for street fights which were spread across the Internet, leading Rolling Stone to call him "The King of the Web Brawlers". Slice left the underground fighting scene and signed a professional contract with EliteXC in 2007. Slice competed in The Ultimate Fighter: Heavyweights,where he lost in his first fight to series winner Roy Nelson. In his UFC debut, Slice defeated Houston Alexander in the The Ultimate Fighter: Heavyweights finale. Slice has since become a professional boxer. 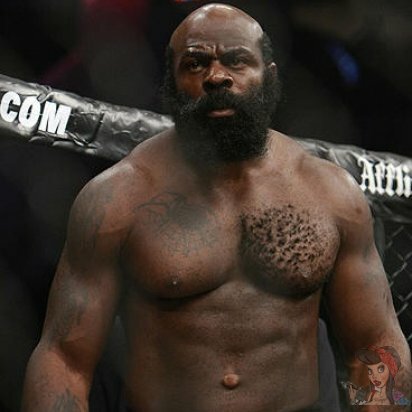 Kimbo has several tattoos on his body that but some are hard to tell what they. On his chest he has a black widow in a web. He has another black spider on his right forearm. He has more on his upper arm which are also hard to see. He has the label No Fear on his left forearm. On his left arm he also has some numbers that are hard to make out.